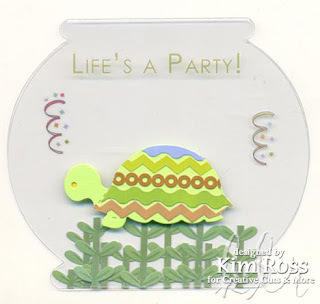 Creative Cuts & More has these round and rectangular MINI ALBUM & TIN KITS. I made mine into a super cute banner, unfortunately, the ribbons made it too bulky so I can't fit it back into the tin (not shown here). That just means I can make something else for the tin....yeay! Cupcake Box Set , get your Cupcake Box Set! And check out this Apron Pocket Card. Visit THIS BLOG for more pics and details. 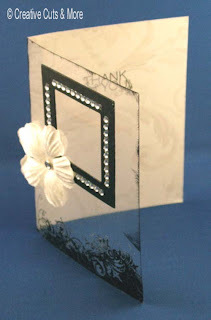 There are so many Die Cut Cards, shapes and Boxes at Creative Cuts & More to choose from!! You even get your pick of material to have the die cut in, from chipboard to polyshrink to felt. 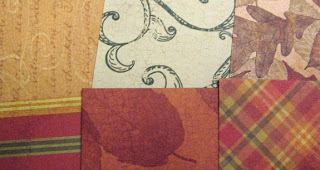 Not to mention a WIDE array of colored and texture cardstock. Hello to all of you Goblins and Ghouls! Feast your eyes upon these spooky little Coffin Boxes. for your guests to take home. 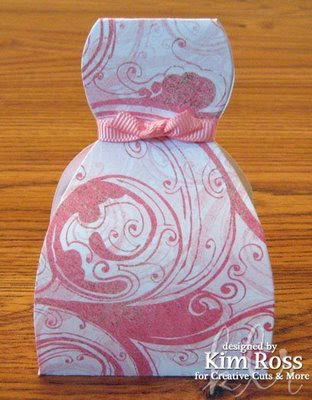 Or as a Hostess Gift at your next Pampered Chef party. to make together while carving pumpkins. For more pics and details go HERE. 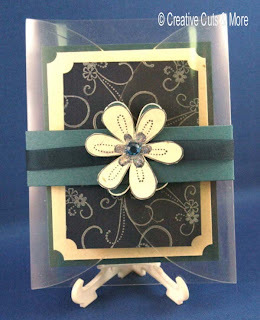 These dresses are from one of the newer dies from Creative Cuts & More, the Dress Box die. It's so easy, and very versatile! My wedding dress was very easy to make. It was cut from Bazzill Smoothies Coconut Swirl. 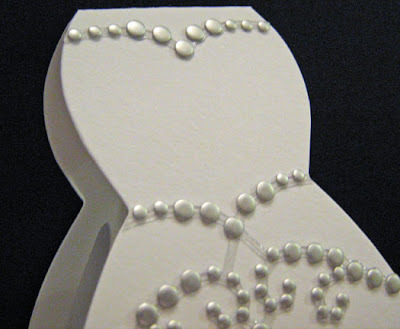 The only embellishments used on the project are Prima Marketing's new Say it in Studs self-adhesive embellishments. The studs were arranged in an ornate frame pattern. I used my sharp Tonic snips to cut only certain parts of the frame to create the bodice, waist, and hem adornments. Because these studs are self-adhesive, they were very easy to adhere. They're nice quality, too, and the segments held together very nicely. My other sample was also very easy to put together. This next dress is cut from BasicGrey patterned cardstock from the Two Scoops collection and tied with a thin pink grosgrain ribbon. I made this to show that this die is not just for weddings! White dresses for Confirmations, Baptisms, First Communion, etc. The possibilities with this dress are endless! 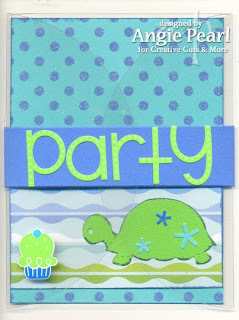 Creative Cuts & More carries a few patterned papers. However, you can also have CC&M cut papers that you send in -- and they cut it for a reasonable cutting fee. You can visit the Contact Us page to inquire via e-mail or by phone. What fun! You're samples are great...can't wait to start hoppin'! I love doodlebug, so I know I'm going to love the new kit. Congratulations, starqueen! Please contact us with your name and mailing address so we can get one of these brand new kits out to you. And what did she win? 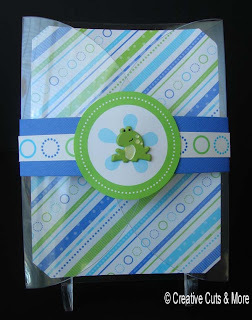 Our brand new designer Sea Life 8"x8" Mini Album Kit! It includes over $45 worth of materials and retails for $34.99. Here's a photo of everything that's included. It's a terrific kit! Keep an eye here for more great eye candy! Welcome to our big August Acetate Blog Hop! We're shining our spotlight on the clear plastic acetate material that makes terrific cards, boxes, embellishments, and more. 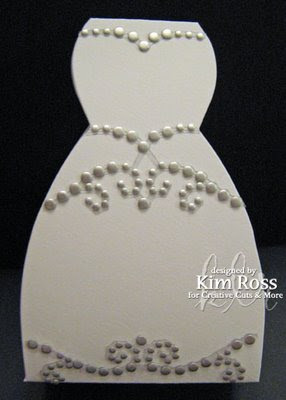 It can be stamped on, painted, and embossed -- which makes it a very fun, versatile choice for any project. And here we have a card from Dusty Patrick. It is the A2 Acetate Card plus straight frame in black cardstock. The rubons are from Basic Grey. 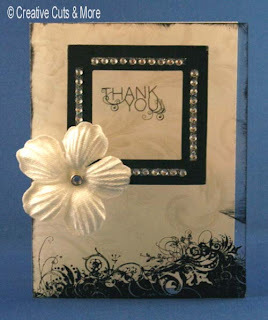 Another sample is this card by Trish Estrella. It is the A2 Gate Fold Crescent Card with Band in Acetate. The stamps are from Fancy Pants. (A) Leave a comment on this post. (This is limited to one per person unless you meet the criteria of B, C, and/or D below.) Tell us all about your Christmas card plans. How many are you making? Do you usually say "Happy Holidays" or "Merry Christmas"? Are they fancy or whimsical? Thank you for coming! The prize has already been awarded. Before you head to Angie's blog and start hopping, we've got some special savings for you! Save 15% at the Creative Cuts & More Store through August 14th by using the code acetatebloghop0809 at checkout. It's clear to see that we've got our big monthly BLOG HOP coming! It'll be full of fun, inspiration and a big prize too! 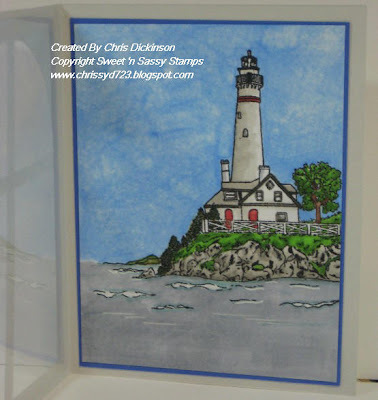 We've shown you several acetate projects here on our blog, and we'll have plenty more starting Monday morning for our Acetate in August blog hop! You'll also get to meet our three talented guest designers! Hello! 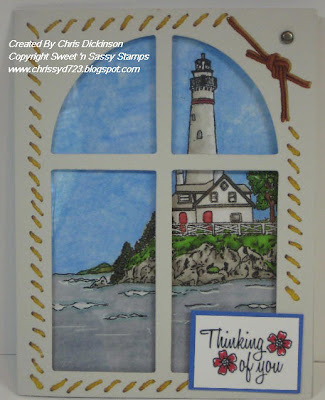 This is the Arch Window A2 Card from Creative Cuts and More! You can use Killer Red Tacky Tape to attach the acetate!